I love October for many reasons but one of the most important is the annual trip to Lake Martin. 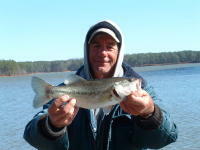 All three bass clubs in Griffin get together for a two day tournament the second weekend in October. The weather is usually great, fishing even better and we all have a lot of fun. This year was a little different. The second weekend in October came a little early since the first was on a Saturday, and a hurricane off the coast brought strong winds to Lake Martin. But the fishing was even better than normal for numbers of fish if not for size. Some folks went over early. Raymond English spent the whole week at the lake and said he caught over 100 bass and over half of them hitting topwater baits, one of the most exciting ways to catch fish. Niles Murray got there Wednesday and caught a lot of fish each day. I also arrived on Wednesday but didn’t get on the water until Thursday. That day gave me an idea of how good it was since I landed about 14 keepers and the quality of fish was good, with many of the spots in the 2 to 3 pound range. Friday I went out with Chad Miller to get information for the November Alabama Outdoor News article. Chad guides there and wins a lot of tournaments, and he seems to know every rock in the lake. He fishes differently, too. Many of us will pull up on a point and start casting, hoping for a bite. And if he fish are biting we will keep casting to that point, no matter what the size. Chad knows the lake so well he will pull up on a point and make five or six casts to a key spot, then move on. He is targeting that three or four pound bass on the point that he needs in a tournament. He may hit 50 places in one day. It works for bigger fish. Chad and his son fished a tournament Saturday while we were fishing our tournament. They weighed in five keepers weighing just under 16 pounds. Their weight would have won our clubs’ two day tournament beating all of us that weighed in ten bass! In the two days 30 fishermen weighed in 262 keeper bass weighing about 339 pounds, most of them spots. There were 24 five-bass limits Saturday and 26 on Sunday. Of the 30 fishermen, 22 weighed in limits both days. In the tournament we pay back each day like it was a separate tournament. On Saturday, John Smith won with five at 9.96 pounds and his 4.49 pounder was big fish, Kwong Yu was second with five weighing 8.47 pounds, third was Robert Proctor with five at 8.43 pounds and Richard Dixon places fourth with five at 8.0 pounds. The next day Jamie Beasley won with five weighing 9.03 pounds and had big fish with a 3.04 pounder, Zane Fleck was second with five at 9.02 pounds, I placed third with five weighing 8.69 pounds and Lee Hancock placed fourth with five weighing 8.28 pounds. As usual, nobody placed in the top four both days. I have no idea where the quality bass I had been catching went! I could not wait to go out Saturday. Not only had Chad shown me some places to fish, I had gone out Thursday before daylight and found a dock with a light on. I could see bass under the water around the light and caught a spot that weighed almost three pounds. And there were at least 15 more that size or bigger following it! Saturday morning there was not a single bass around that dock. That worked on my mind. Then I hooked a two pound largemouth in a tree top on a topwater bait and it jumped and threw the bait, then a keeper spot did the same thing. Starting out so bad messed my mind up. I fished hard all day but landed only 9 keepers, my worst day, and had 5.83 pounds with my best five. Sunday morning I could see two bass under the light but neither of them would hit. But at 7:30 I went to a rocky point where I caught fish 40 years ago and had a limit in the livewell, all on topwater, by 8:00. That put me in the right mood so I started fishing places where I have caught fish in the past, and landed 19 keepers during the day and placed third. The point I caught fish on first thing is one I fished back in the mid 1970s. It runs out shallow for about 20 feet and years ago there was a dock on the end of it with a walkway going out to it. Linda and I were fishing it one morning and the cabin owner walked out and talked to us. He was very nice, even pointing out where he had brush piles. We caught a lot of fish with him watching. The next weekend in the Sportsman Club tournament Harold Cox and I started there at daylight. As we started casting the cabin owner came out on his porch up on the hill and started yelling at us, cussing us for everything he was worth. I ignored it but Harold yelled back so I cranked up and left. There is no place to hide in a boat if the guy in the cabin had lost it and got a gun. I had not fished that place in almost 40 years because of that, but I noticed Sunday morning the dock and cabin have been torn down and a new house is being built. I am glad I stopped there Sunday morning. This entry was posted in Bass Fishing, Tournament Fishing on October 16, 2016 by ronniegarrison.